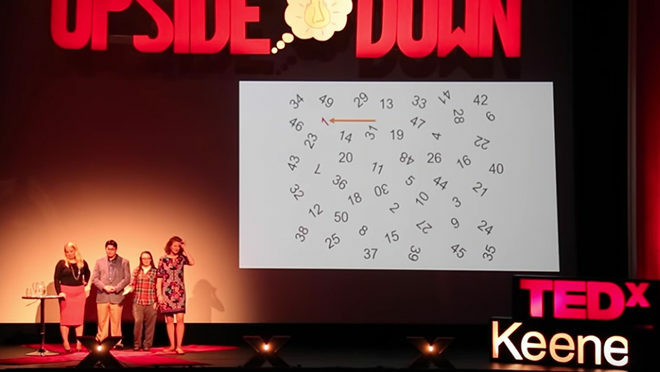 RSEC faculty and students led a TEDx Talk event at Keene entitled Leveling the Playing Field, a discussion on strategies to help those with learning differences effectively take in information. How can we be more mindful in how we engage with students with learning disabilities? Bridgette Doucette Howell and Alison Batey from the RSEC Academy, (Regional Services and Education Center) showed attendees how they break down barriers through positive approaches. Alison has a Masters in Special Education and a Bachelors in Communications, both from the University of New Hampshire. She is the Transition Specialist at the Resources Services and Education Center Academy where she helps students for life after high school for the past 10 years. P.A.L.D. (Positive Approaches to Learning Disabilities) is a free professional development offered to schools, libraries, colleges, and business an interactive approach on how to work and teach individuals with disabilities. P.A.L.D. is made up of students from the RSEC Academy. RSEC is a nonprofit 501(c)(3) entity created to provide school districts in southern New Hampshire with a variety of high quality educational and special needs focused programs and services. Bridgette Doucette Howell is going into her 7th year at The RSEC Academy. Bridgette has a MAT in Secondary Education with a focus on History and Theatre. She also has a BA in Theatre both from UNH. In 2016 she was a semi finalist for the NH Teacher of the Year award. P.A.L.D. (Positive Approaches to Learning Disabilities) is a free professional development offered to schools, libraries, colleges, and business an interactive approach on how to work and teach individuals with disabilities. Regional Services and Education Center, Inc. was created to provide school districts in southern New Hampshire with a variety of high quality educational and special needs focused programs and services. This talk was given at a TEDx event using the TED conference format but independently organized by a local community. Watch the video here.